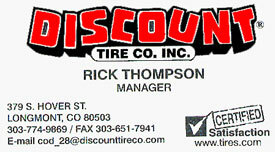 Wednesday March 14th, 6:30pm to 9:00pm - Meeting, Moose Lodge #1548, 2200 Pratt Street, Longmont, CO 80501. Open to all members and guests. Report on our annual VSA with the Boulder Ranger District for our annual volunteer projects. COA4WDCI 1st Q meeting report. Vic reported that there is a 2018 Raffle Vehicle, done by Big Horn. Special edition newsletter will be produced. Holy Cross City 4WD road will have a work project in July. 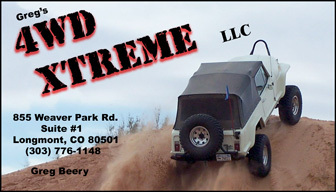 Grand Mesa Jeep Club will be joining COA4WDCI again. Unser Racing was the entertainment. Vic represented our club well. Gordon discussed the May 14-22 Utah trip to explore the Henry Mountains. Limit of eight vehicles, trip is full. Forum has been started. Report on Florence, Arizona trip. Last month’s multiple-part question was presented by Greg B. 1. What was the first production year for the Jeepster? 2. What was the last production year for the Jeepster Commando? 3. How many Jeepster Commandos do we have in the club? 4. Who owns each of these? It was decided that this question was worth 6 points, 1 each for the first 3 questions and 1 for each person identified as a Jeepster owner. Several people got some of these correct, so the points battle began in earnest with this one. Congratulations to Gordy H for getting 5 points; the only part he missed was the first question, which he answered 1949 rather than 1948. Gary B, Jim C, Karla H, Paula K, Richard H, James H, Brian G, Debbie T, and Vic W all received 3 points. This month’s trivia will be brought to you by Gordy H, who holds the lead for 2018 with 5 points.